Binational culture project Beyond the Wall is bringing 15-foot tall puppets to Nogales this November 24th-25th , as the centerpiece of a two-day binational cultural festival celebrating the unique culture of the borderlands. Now more than ever we want to remember that whether we are on this side or Beyond the Wall, collective conscience unites us all as what we are: humans. Beyond the Wall will begin in Nogales, Sonora (Mexico) on Friday night, November 24th at 7pm with an art exhibit opening at the Museo de Arte de Nogales (Av. Adolfo López Mateos 120, Fundó Legal, Centro, 84000 Nogales). Led by Raul Leyva and Colectivo Taco de Perro, the exhibit will feature a collection of art commissioned from artists on both sides of the border. From 10am – 4pm on the 25th there will be a daytime block party in downtown Nogales, Arizona (USA) led by local entrepreneur Stephanie Bermudez showcasing local arts and businesses along Morley Ave. Immediately following on the 25th there will be a concert and festival on the adjacent side of the border wall in Nogales, Sonora from 4 – 10pm. The 15-foot tall puppets will appear first on Friday night, and then as the centerpiece of the festivals on Saturday where they will bring the crowd together at the wall in a moment of cultural unity. The festivals will feature local artists and businesses from both sides of the border in a celebration of borderland culture. The project is the subject of a documentary film. For more information, visit www.PuppetsAtTheBorder.com. Beyond the Wall recently held a developmental workshop in New York with thanks to Anne Cubberly and Public Works Department, and with support from the Governor’s Island Trust, Fractured Atlas, Materials for the Arts and through the generosity of private donors. For photos and video footage, please visit: www.puppetsattheborder.com. For sponsorship information, please contact Stephanie Bermudez at info@puppetsattheborder.com. 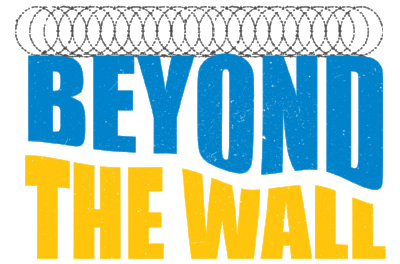 Beyond the Wall is led by Ana Díaz Barriga, Jess Kaufman, and Zulema Rodriguez, with Stephanie Bermudez and Raul Leyva leading the events in Nogales Arizona and Sonora (respectively). Ana Díaz Barriga is a puppeteer and theater artist from Mexico City, who has performed in Italy, UK, the Czech Republic and Mexico. Díaz Barriga’s puppetry training includes work with Gyre & Gymble, Yael Rasooly and Improbable. Kaufman and Díaz Barriga met while studying at the Royal Central School of Speech and Drama (London) on the MA Advanced Theatre Practice course. Stephanie Bermudez is a Nogales-based leader and entrepreneur. She founded Startup Unidos, a leadership podcast that spreads actionable advice from people across international borders who are seeking to startup, invest or participate in AZ/SON regional innovation and entrepreneurship movements. She is a member of the Tucson Hispanic Chamber Foundation and serves as the Young Entrepreneurs Academy Tucson’s Program Manager and BIG IDEA Instructor. Jess Kaufman is a theater and performance artist from New York City whose work has been performed in London and New York, with upcoming performances in Glasgow. Her performance credits include Dear Edwina at the DR2 and the first national tour of ‘SWonderful: The New Gershwin Musical. Raúl Humberto Leyva is a journalist born in Guaymas, Sonora. He is currently the coordinator of the Colectivo Cultural Taco de Perro, which has been promoting all kinds of arts at the border for over 25 years. Zulema Rodriguez is a Phoenix-based artist and political organizer. She was the deputy national director concerning mass incarceration for the political advocacy group Center for Community Change (CCC) until early 2016. She has worked on immigration reform with the SEIU, implementing field strategy nationwide holding elected officials accountable in their support for a comprehensive immigration reform.